OSEIA Executive Director, Jeff Bissonnette, gave a speech at the Annual Member Meeting about some of his observations about the solar industry as he concludes his first month on the job. The following article is adapted from that talk. The main thing I’ve learned in my first month is that Oregon’s solar industry is ready to play a major role in Oregon’s energy future and provide innovative products and services to Oregon consumers. It’s become a buzzword in business circles these days to say that something is going to “disrupt an industry.” But solar is poised to not just disrupt the energy industry (which it can do) but ultimately, solar will disrupt society…in a good way. Solar has always been about literally putting power into the hands of the people. With advances in technology and efficiency which affect price, solar will play a major role in our country’s energy future. We here in Oregon’s solar community can be leaders in creating that future. To create that future, we will need to get very involved in talking about the details of our vision. Getting those details right will require a couple of key activities that will be priorities over the next several months. First, most OSEIA members have business plans that guide business strategies and activities. Likewise, Oregon’s solar industry needs an Oregon Solar Business Plan to provide a unified narrative of where the industry is going. The effort to develop such a plan can be modeled on the Oregon Business Plan process where state business leaders, policymakers and other stakeholders develop a business path for the state. Similarly, developing an Oregon Solar Business Plan could bring together solar industry players, legislators and other decision-makers, consumer advocates, labor representatives, utilities and others to create a shared vision for solar in Oregon. That solar business plan could provide a pathway that the industry could use to invite others on the journey to build solar into a major Oregon industry. Second, OSEIA will be undertaking a policy development process to prepare for the 2017 legislative session and beyond. It may seem strange to talk about developing a 2017 agenda while the 2016 session is still underway. But it will take the next several months to have the conversation that this diverse industry requires. At the end of that conversation, Oregon’s solar industry will have an agenda where every part of the industry – whether global solar module manufacturer, commercial or utility-scale project developer or rooftop solar installer – will recognize their piece of that agenda. Further, basing the agenda in the ongoing development of a solar business plan will lend a coherence and a coordination that is needed for policymakers to understand how various policies fit into the larger vision. As part of that policy agenda process, we will not be waiting to present the agenda at the start of a legislative session. Rather, we need to build support for that agenda as part of the campaign process as people are running to serve in the legislature. 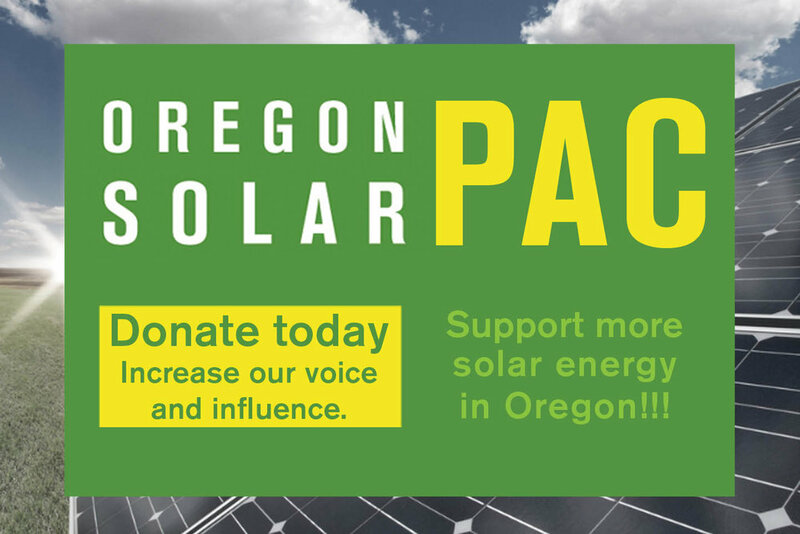 We can engage in campaigns through an Oregon Solar PAC and the board will be taking up consideration of creating a solar PAC at their next meeting. The two priority areas of developing an Oregon Solar Business Plan and developing an industry-wide policy agenda are simultaneously targeted and massive. But they are necessary so that the industry can speak in one voice about a clear vision. That description perfectly outlines the task we in Oregon’s solar community have before us – solve extremely difficult problems in the most challenging situations. We can put a finer point on those components. Extremely difficult problems: develop energy sources that are clean, consistent and affordable. Most challenging situations: help a planet facing massive changes due to the climate effects of 100+ years of a fossil-fuel-based economy. To solve extremely difficult problems in the most challenging situations, we will have to have vision, yes, but we will also need to crunch numbers, do the physics, present cold, hard facts and figures and demonstrate the high-value business case that solar provides. In short, we will need to be “steely-eyed solar men and women” to succeed at the task that is before us as an industry. A clear vision with one voice from steely-eyed solar men and woman. That sounds like a great base for a plan for OSEIA members to pursue. Let’s pursue it and go solar!